When approaching external suppliers to partner with on a digitisation project, or preparing an application for funding, preparing as much information as possible about the collection(s) you want to digitise from minute one can really save time. Not to mention help to accurately forecast project timescales and provide accurate projected costs – to avoid any unexpected costs down the line. Although a thorough supplier should request all the information they need (as well as ask to view a sample of the collection) when you approach them – to get your project off the ground as soon as possible it is beneficial to have the relevant information available from minute one. But what’s relevant in the context of YOUR digitisation project? A provider will need different information depending on the type(s) of analog media to be digitised – and the goals of your project. So in order to help you quickly and easily prepare the information you need, we have put together this handy guide organised by format (together with a free downloadable project planning tool) below. *If a bound volume has tight binding, text may be distorted in the final images which can be problematic if planning to incorporate OCR. Informing a supplier about any unusual elements or different materials used will avoid delays or constant recalibration of equipment during digitisation. Likewise, providing volume dimensions allows the supplier to plan the digitisation workflows accurately and mitigate any potential delays. Where your photographs are in albums, removing to be digitised can be a time consuming process and so informing a potential supplier as early as possible will result in a more efficient project. If you are unsure whether your photos need to be removed for digitisation, don’t worry as the supplier will be able to advise you on the best option. If you hold a mixed collection, featuring both loose photographs and albums, it is useful to provide the supplier with an approximate breakdown of each type to aid accurate project planning. Note: for very large (A0+ size) maps and plans, a supplier may advise scanning the item in sections and digitally stitching together the images in order to capture more detail. Loose manuscripts are often stored in envelopes or similar. If this is the case, include these details, as preparation time will need to be factored into the project length. Unusual materials, such as vellum pages, will also impact overall project length. They generally require special attention and take longer to digitise so should be brought to the attention of your potential supplier. Due to their fragile nature, 35mm slides are often stored in specially designed boxes or folders. In these situations, notify your potential supplier as any preparation time will need to be factored into scheduling. Different reel formats and magnification variation can affect the image capture resolution when scanning the film, and so noting any variations can help achieve highest quality digital images. Note: typically 16mm reels are 24x magnification with approximately 2000 images per reel and 35mm are usually 11x – 15x magnification with roughly 700 images per reel. Glass plates are often stored in boxes or envelopes for protection. Factors like individual envelopes for each plate impact the speed of digitisation workflows and informing the supplier early on will help to mitigate this. Damaged or broken slides are also important to bring to the attention of the potential supplier. These are not a problem and in most cases can still be digitised, but may require extra attention which needs to be planned in. No matter what media you are looking to digitise, it’s essential to let a potential digitisation partner (or funder) know early on the end goals of the digitisation and how you plan to use the digitised images once the project is completed. 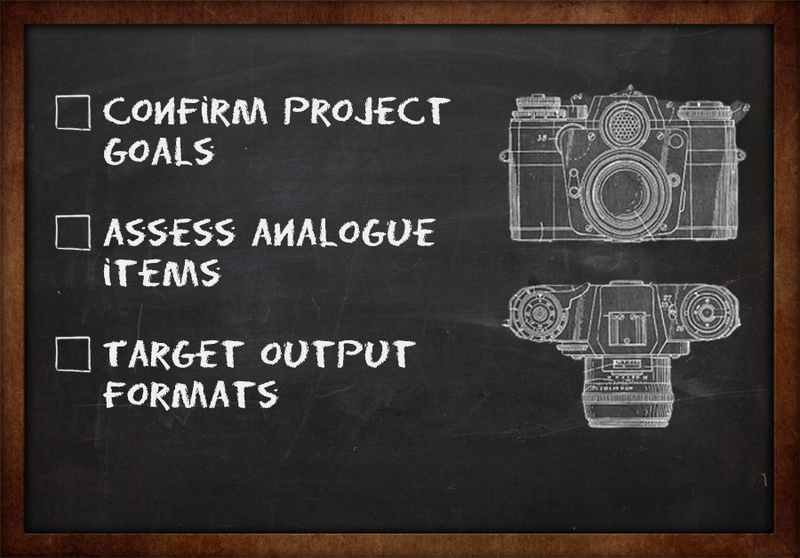 Sharing your goals with the supplier from minute one will allow them to provide the best advice with regards to technical aspects of the project like suitable image capture resolutions, output file formats, colour profiles and more. How you would like the digital image files to be named is also an aspect of the digitisation process it is important to consider early on. For example, for preservation purposes filenames of 001.TIF, 002.TIF etc stored within an appropriate folder structure may be sufficient. But if the images are to be accessed via a searchable digital archive then descriptive metadata within the filenames is vital. i.e. Bookname_year_chapter01_pg01.JPEG. One factor we have only briefly mentioned above, which absolutely affects digitisation workflows, is the condition of the materials to be digitised. We have omitted this to keep the post to a reasonable length, but criteria for assessing the condition of different media to be digitised is covered in depth in our free downloadable tool below. As we have noted above, a thorough digitisation provider will normally request to view and assess your collection – or a sample of it – in person in order to provide the most accurate project timescale forecasts and of course quotes. There’s a lot to consider above and, depending on the composition of your collection(s), not all of it will be relevant to you. So to help the time poor archivist, librarian, or record manager, we have put all this together in a pre-made downloadable project planning tool – divided by item medium – to enable you to quickly and easily gather only the information relevant to your specific project.